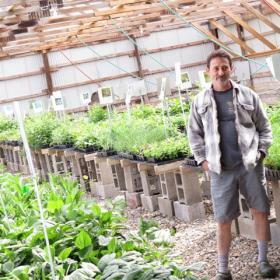 Bill Schneider has operated Wildtype Native Plant Nursery in Mason for the past 17 years. As a true native Michigander, Schneider has degrees from both Michigan State University and the University of Michigan. He moved to northern California in the 1980’s where he further developed in his growing interest in native plants. Schneider returned to his home state in the 90’s and started Wildtype. The nursery grows native Michigan plants and also designs ecologically focused projects such as prairie and wetland mitigation, and storm water recovery works. Current State’s Peter Whorf recently met with Schneider in Mason to discuss the importance of native plants and Bill’s passion for his work. He says his passion for native plants started when he moved to California and began to realize the importance of native plants to the local environment.